I liked Nyx, although I’m sure she will be a hard character for others to like. She’s a flawed character, but almost everyone in this story is flawed in some way. I love flawed characters, and I love a world filled with characters who live in the grey, so Nyx was a great character for me. Even in her anger and bitterness, I could see her hope, her compassion, and her kindness. She refused to be submissive to Ignifex and her strength showed throughout the book. She wanted to save her people even though she hated that she was forced to do so. She wanted to save her sister, even when her love was tainted with her bitterness and hatred. She worked hard even though she knew that the price may very well be her death. She grew throughout the book, and showed less of her anger and bitterness, but she never lost her strength. There is a love triangle, sort of, which normally I would hate. This one isn’t that bad, but mostly because it is only sort of a love triangle. I don’t want to go into details because it might ruin some of the story. I will say that there is some instalove that caught me totally off guard. Although it was very quick and quite surprising, for some unexplainable reason, it didn’t really bother me that much. Maybe because I just rationalized that Nyx needed some love and let it go. I LOVED the interactions and banter between Ignifex and Nyx. In the first interactions with Ignifex, it was hard to remember that he is supposed to be an evil demon ruler. He’s so amusing and amused by Nyx. I wish that there would have been more interactions between Ignifex and Nyx and less time with Shade. Sure, Shade is supposed to be the “good” guy, but their interactions were missing something, some spark, some humor, some passion, that was present when Nyx was with Ignifex. “Well, I’m already hoping there could be a dinner where you don’t try to stab me with your fork,” he said. 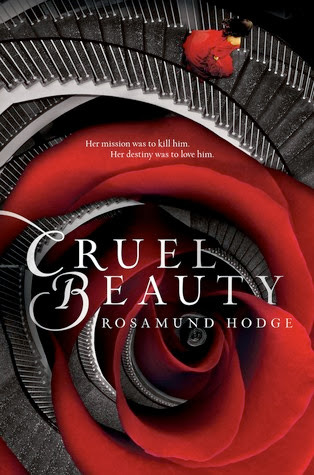 I would say that this book is loosely based on Beauty and the Beast, and is mostly based on the Greek/Roman myths. I absolutely do not get the reference to Graceling in the synopsis- even the genre is off. To me, Graceling is more epic fantasy. This is clearly young adult fantasy with some basis in Greek mythology. Overall, I really enjoyed the novel, although it does have its issues. I can also see that it won’t be a novel for everyone, especially those who go in expecting more fantasy plot than romance. Regardless, I will be interested in reading whatever Hodge writes next, especially if it is another stand alone. Glad you enjoyed this. Me too. I like flawed characters too. That cover is breathtaking. I'm glad it's a stand-alone too. It seems all YA second books aren't as good as the first and I'm disappointed. I know! Two things I hate - sophomore slump and killer cliffhanger endings! I did see that there is a novella set in this world and based on Cinderella, but at least it's not a true sequel. I have seen this around, and seen some mixed reviews, so I cannot quite make up my mind. I love the cover though! Thanks for the review!